For over 25 years, Brende and Lamb has cared for trees in the Bay Area following the highest standards of tree health and aesthetics. Our staff is expert at both the art and the science of tree care. A well-pruned tree is both healthy and beautiful. We give free estimates and guarantee customer satisfaction. Trees are the backbone of the urban ecosystem; they provide habitat, shade, and protection against storms. Trees also absorb pollution, help fight global warming, and make up between 5% and 20% of a home's value. Brende and Lamb’s mission is to apply the science and art of tree care to help your trees be as healthy and as beautiful as possible. Within almost every tree, even those that have been abused and neglected, there exists a beautiful plant waiting to be revealed. Even if 30% of the foliage is removed, well-pruned tree should still look natural after it is pruned. 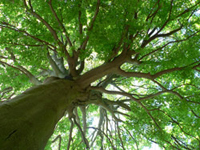 Our mission is to make your trees as safe, healthy and as naturally beautiful as possible. Why Choose Brende and Lamb? In a recent poll by the SF Chronicle and the Bay Area Checkbook, Brende & Lamb was voted one of the two best tree companies in the Bay Area. This reputation has been earned by our skilled staff, many of whom have been with us for over a decade and some for over two, and by our ongoing commitment to customer satisfaction. High quality tree work requires balancing the needs for privacy with those of aesthetics, safety, and tree health. It requires years of experience to expand views or improve safety while enhancing the tree’s natural beauty. At Brende and Lamb, we recognize the relationship between the quality of one's environment and the quality of life, and consider it an honor to care for trees. Our estimates are free, our staff helpful and friendly, and all of our work backed by a money back guarantee. One of only 2 tree services in the East Bay in the Good Service Guide. In a 2010 poll conducted by the San Francisco Chronicle and Bay Area Checkbooks, Brende and Lamb was voted one of the two best tree companies in the Bay Area.